Japanese summers are cruel. They drain your energy and force you into eating too much ice cream. But once they’re gone — as odd as it sounds — you find yourself stuck in a withdrawal period. You think of the ocean breeze you missed while avoiding the beach crowds, the sweaty late-night river walks, the vivid colors of nature, the shimmering Tokyo Bay waters, the drinks on the bar counter and all that food you enjoyed while listening to yet another version of Despacito. 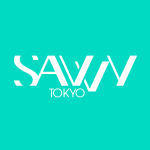 Luckily, just as we witness another summer pass us by, a restaurant that seems to have perfectly locked in everything summery in one single place, has just opened in Tennozu near Shinagawa, and the good news is that it’s here to stay through the momiji, the snow and the sakura, too. Located on the banks of the Tennozu canal just outside Tennozu Isle station, Ride is the latest addition to Tokyo’s hip waterfront area of Tennozu; a place that, with its open-air markets, art events, casual riverside restaurants and romantic vibe, is on its way to becoming a mini version of Venice in the big metropolis. 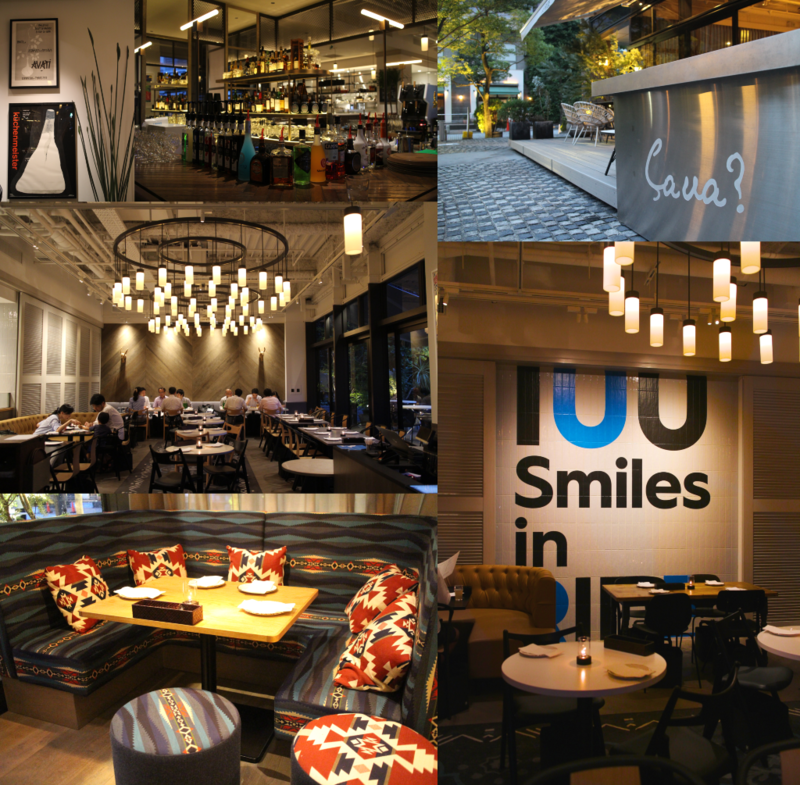 Opened this August, Ride offers spacious outdoor seating space facing the canal, and equally spacious indoor room, each side of which is divided into differently designed sections — from white sand-inspired chairs to chic dark wood tables, to long canapes and colorful couches for those in need of a bit more privacy (and close proximity to the bar). 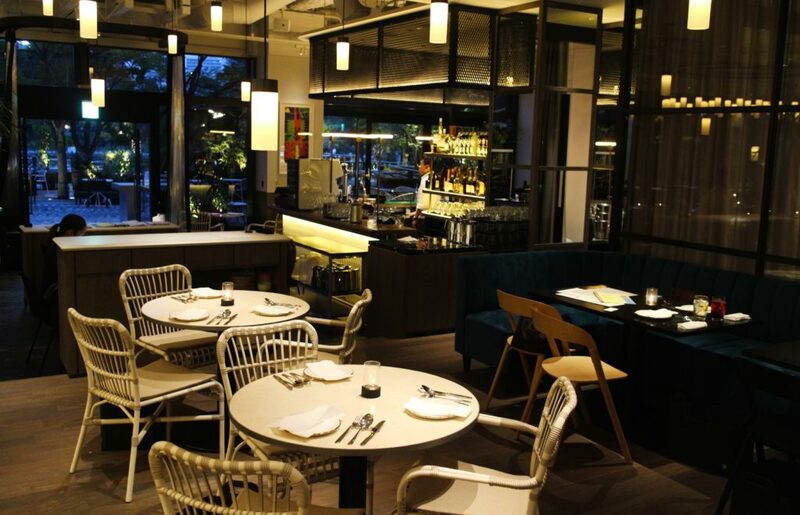 The restaurant’s theme is ocean and you get that as soon as you walk in, feeling ready to swap your shoes for beach sandals and let your hair loose after a long day at work. The background music is on top of its game, playing cool tropical tunes, to the rhythm of busy waiters as they swim their way around tables looking all smiles despite their obviously busy shifts. The colors of the interior are bright and vivid and the bold “100 Smiles in Ride” sign on the wall assures you that your happiness matters more than anything else here. Ten minutes at Ride and you’re already feeling relaxed, ready to start with a cocktail and relive your best summer memories. 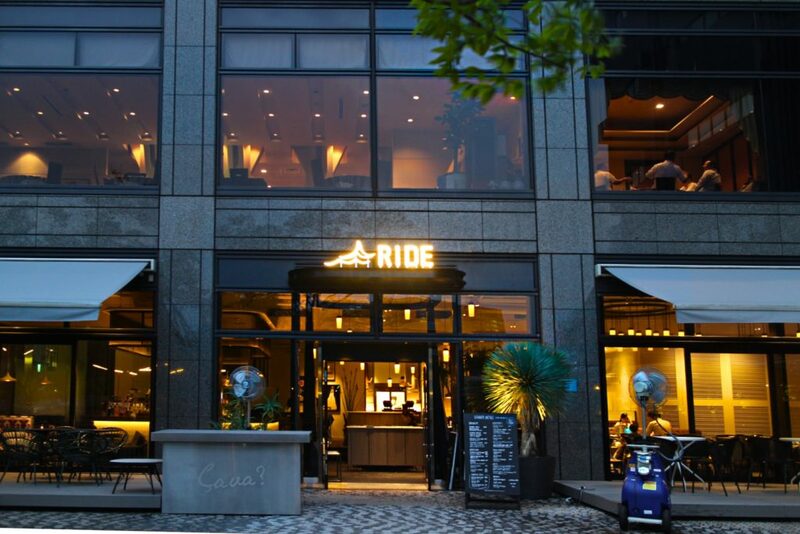 In line with its theme, Ride is a bottomless ocean of different types of cuisine, stretching from seafood appetizers to slow-cooked churrasco-style meat skewers and desserts inspired by different regions of the world. The base, according to the very outgoing (and surprisingly young) store manager Tsubasa Yamaguchi, is Italian cuisine, but the menu literally looks like a foodie’s world map: you’ll find oriental fish curry, feta cheese, marinated Tasmanian salmon, wagyu beef, truffle french fries, charcoal grilled squid, a great variety of pizza and pasta, and even Yorkshire pudding. The desserts even include a choice of Australia (and New Zealand)’s favorite Pavlova. There are plenty of drink options, too. And a happy hour! 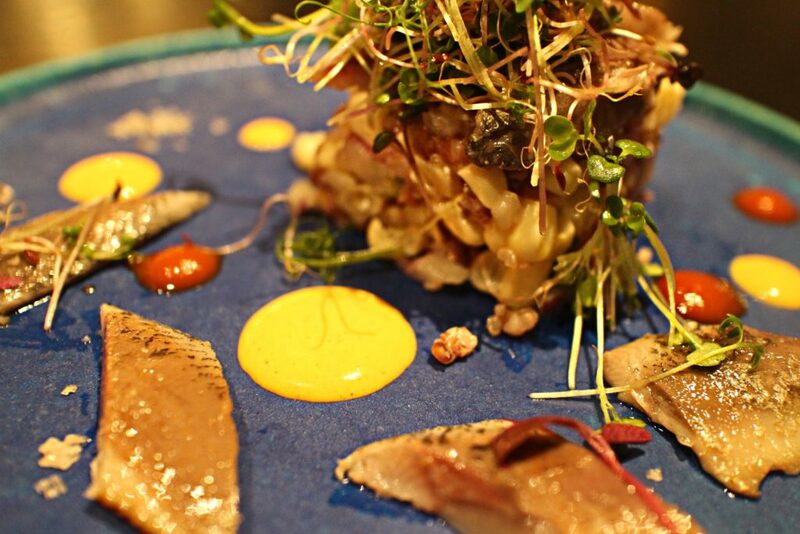 A recommended full Ride course begins with a special from the chef’s recommended selection, which includes a variety of Instagram-worthy dishes, most of which are seafood-based, and ends with a dessert. Add a cocktail of three in between each meal and you get the whole picture. 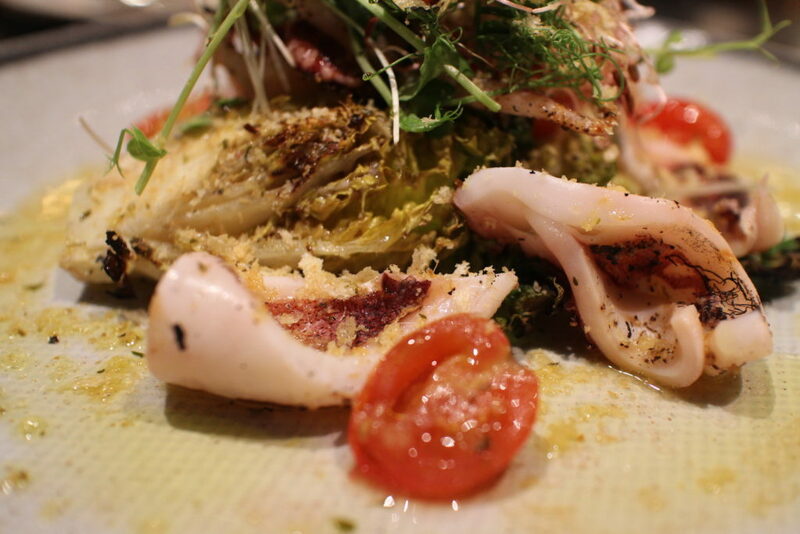 For a starter, we opted for the Charcoal Grilled Squid & Sucrine (¥1,450) special, an olive-based, sucrine lettuce and fiber-rich salad inspired by Southern France, which perfectly combined the softness of the vegetables and the chewiness of the squid. We continued with two extra appetizers, the beautifully presented Smoked Deviled Egg (¥700), a plate of five half cuts of smoked eggs with fried bacon and sauce for topping, and the Marinated Herring, Glutinous Wheat and Quinoa Solterito (¥1,350) salad, the ultimate #foodbeast dish for the night. Both dishes were light despite their rather larger portions and totally okawari-worth delicious. For our main course, we chose one meat dish and a pizza, leaving our pasta cravings for the next visit due to stronger cravings for Pavlova and an already significant lack of stomach space. The meat options at Ride are abundant and all come with a choice of garnish of your preference (yes, including creamed spinach). The meat is slowly cooked on a 500-degree charcoal grill plate by a pleasant meat expert who doesn’t mind showing you his steak flipping skills upon request — which we, of course, did. 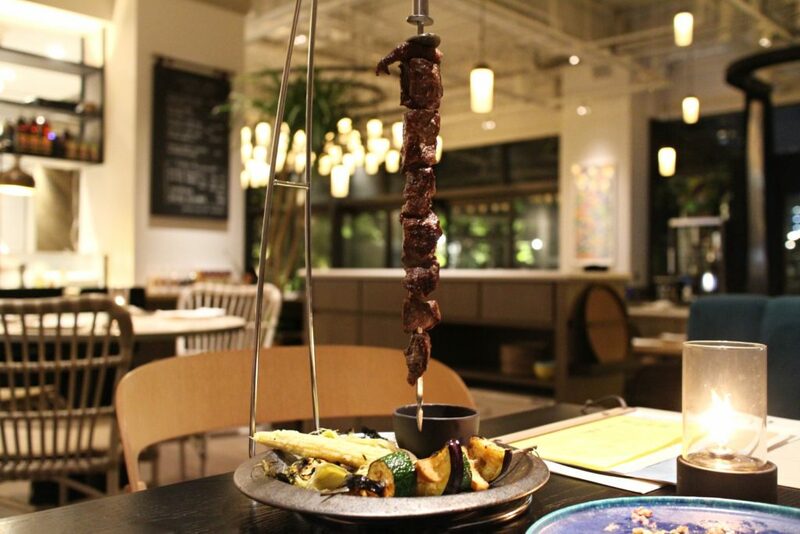 Our choice of wagyu beef (¥3,300) came in a massive plate, hanging on a vertical skewer, the bottom of which was filled with grilled vegetables and a spicy dip. Just as we were promised, the meat was crispy on the exterior and soft on the interior and it didn’t take more than five minutes to completely wipe it off that gorgeous plate. In the ocean world, after all, survival depends on speed. 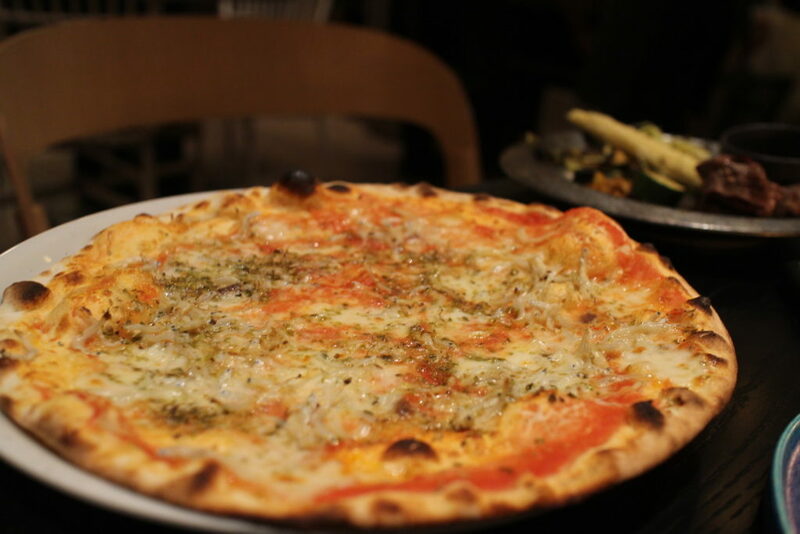 The last dish on our plate before dessert was a massive tomato-base sauce Bianchetti pizza (¥1,600), topped with shirasu, cherry tomatoes, anchovy and mozzarella. This extremely thin crisp creation was much larger than expected and perhaps fit for a group of at least four. We were two, and ate the part for two, but brought the rest back home saving it for our hungry post-midnight selves just because It.Was.That.Delicious! 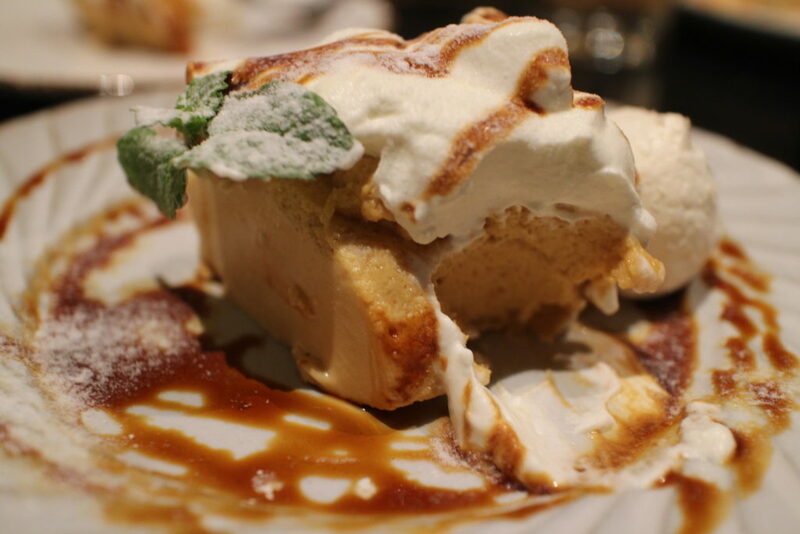 The caramel mousse Pavlova (¥900) (pictured above) at the end of the night was worth all the waiting and space saving — it was the perfect size, the perfect sweetness, and the perfect look for one last Insta post. Though conveniently located just outside the station, a much more exciting way to get to Ride is by getting on the “Tokyo Water Taxi,” Japan’s very first charter waterfront taxi boat along Tokyo Bay. Available on Fridays and weekends, for ¥4,500 at lunch and ¥8,000 at dinnertime, you can purchase a dining and riding set that includes a full meal (with a dessert!) and a ticket to the boat for a post- or pre-lunch cruise. You can also choose your boarding or descending destination — either Tamachi or Nihonbashi ports, and enjoy a 30- or 50-min sightseeing tour under Rainbow Bridge. Later in the day, you can actually mean it when you tell your friends that you take a boat to go to lunch. 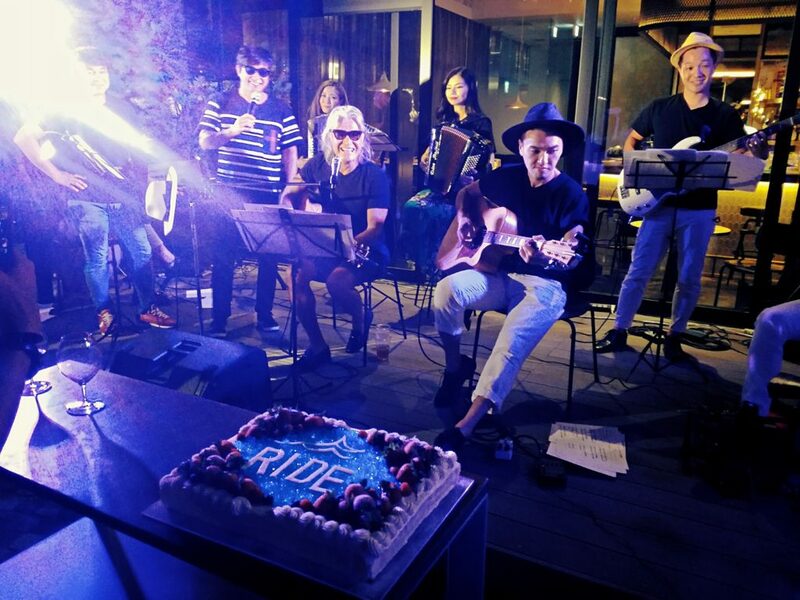 Ride has plenty of space and means to fit and feed all the fish in the ocean, making it a wonderful destination for parties, birthday celebrations and even post-wedding receptions. The Ride crew threw a birthday party for their operating company Balnibarbi’s president on August 19th, the day of the preopening party for Ride. The basic party plan includes a full seven-dish course and all-you-can-drink for ¥6,000 per person (currently ¥5,000 to celebrate its opening), though a quick inquiry to the friendly staff can help you customize your own party plan depending on your needs. There are over 300 seats, including the spacious terrace, a DJ on set and a romantic promenade to take as many photo mementos as you wish. And while you wait for the next summer to come, stop by at Ride and relive the season — no matter how nature’s colors change outside! Reservations: 050-3184-2730 or online (English available). Business hours: Lunch: 11:30 a.m.-2 p.m. (weekdays), 11:30 a.m.-3 p.m. (weekends and holidays); Dinner: 5:30 p.m.-10 p.m. 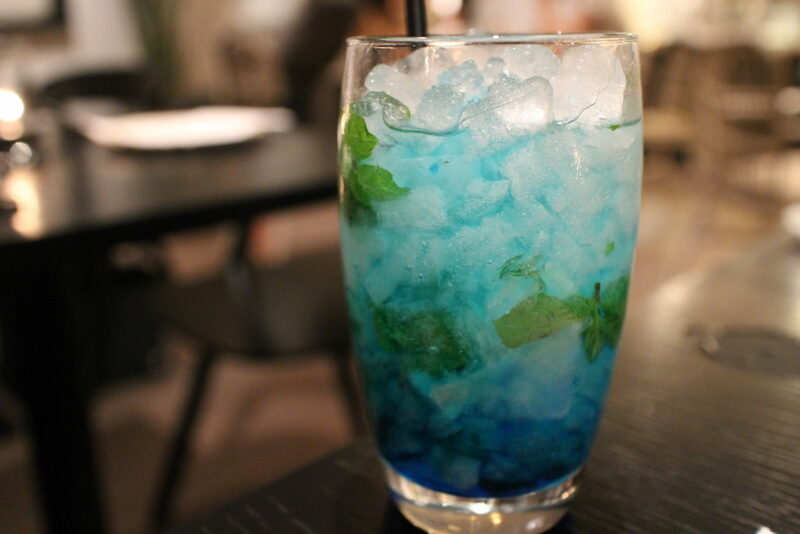 Happy hour: 5:30 p.m.-7 p.m. for ¥500/drink.